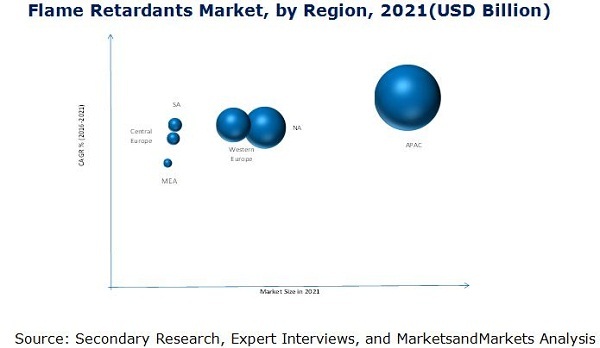 [172 Pages Report] The global flame retardants market is projected to register a CAGR of 6.4% during the forecast period to reach USD 12.81 billion by 2021. Increasing fire safety regulations and growth of end-use industries to drive the flame retardants market. In this study, 2015 has been considered as the base year and 2016–2021 as forecast years for estimating the market size. Fire safety regulations are getting stringent across the globe giving leading to the development of innovative flame retardants. The development of flame retardants is strongly influenced by the stringent legal frameworks and industry standards. Fire safety regulations are varied across different regions depending on the corresponding national regulations for health and environmental security, especially in Europe and North America. Fire safety regulations in different regions or countries have made it mandatory for the end-users to incorporate fire retardant materials into their product. This is expected to trigger the growth of the flame retardants market between 2016 and 2021. The flame retardants ecosystem comprises processing of bromine, chlorine, phosphorous, aluminum, antimony, and others (zinc, nitrogen, and melamine), the basic raw materials used for flame retardant production. Glencore Xtrata (Switzerland), BHP Billiton (Australia), Rio Tinto (U.K.), Anglo American (U.K.), and Vale (U.K.) are some of the major raw material suppliers. The manufacturers of flame retardants procure the processed raw materials in different physical forms. Major flame retardant manufacturers are Albemarle (U.S.), ICL (Israel), Chemtura (U.S.), CLariant (Switzerland), BASF (Germany), The Dow Chemical Company (U.S.), Lanxess (Germany), Nabaltec (Germany), and Italmatch (Italy). These flame retardants are used in various applications, such as epoxy, polyamide, polyurethane, polystyrene, PBT, PET, ABS, and others. They process the raw materials according to the applications and requirements of the end-use industries. The requirement of these products depends on their uses in the building & construction, electronics & appliances, automotive & transportation, wires & cables, textiles, and other end-use industries. EFRA, NAFRA, EBFRIP, REACH, and RoHS are the major regulatory bodies that set the standards and guidelines for the use of flame retardants and toxic chemicals. In January 2015, Albemarle (U.S.) restructured and divided the business units performance chemicals and catalyst solutions into three segments, performance chemicals, refining solutions, and Chemetall surface treatment to strengthen its command in the industry and increase its assets value. What are new product types companies are exploring? The flame retardants market is projected to reach USD 12.81 billion by 2020, registering a CAGR of 6.4% between 2016 and 2021. Flame retardants are key components used in reducing the devastating effect of fire mishaps on people, property, and the environment. Most common elements used as flame retardants are bromine, chlorine, and phosphorous. The compounds of these elements are added to or treat potentially flammable materials. Flame retardants stop the fire by interacting with the fire cycle in the gaseous phase and stop the chemical chain reaction. Flame retardants are key components used in reducing the devastating effect of fire mishaps on people, property, and the environment. Most common elements used as flame retardants are bromine, chlorine, and phosphorous. The compounds of these elements are added to or treat potentially flammable materials. Flame retardants stop the fire by interacting with the fire cycle in the gaseous phase and stop the chemical chain reaction. The flame retardants acts in two ways; they either prevent the fire from starting or slow it down significantly. They are added to plastics, among other materials, and also do not alter the properties of the parent material. The flame retardants market is segmented by type as Aluminum Trihydrate (ATH), antimony oxide, brominated, chlorinated, and phosphorous. ATH dominated the flame retardants market, with Asia-Pacific as the largest market in 2015, and the trend is estimated to remain same during the forecast period. Western Europe and North America are the second largest markets for ATH flame retardants. The main reasons for growth of ATH are low cost and less environmental impact in comparison to certain flame retardants. Brominated flame retardants are projected to witness a moderate growth in North America and Europe owing to stringent environmental regulations imposed to curb the issues pertaining to toxicity. Asia-Pacific is the largest market for flame retardants. The region is projected to register the highest growth owing to vast potential that can be realized in near future because of increasing safety concerns and growth of various end-use industries in the developing economies in the region. Brominated flame retardants dominates the Asia-Pacific market owing to their inevitable use in the electronics industry, which is backed by their high efficiency and chemically inert nature. China, Taiwan, and South Korea are the leading players at the global level. There are three major categories in which flame retardants are required in the building & construction industry; are for insulating cables & electrical wiring, structural insulation for making the material more thermal resistive, and for insulation of structural elements such as metal sheets, wood, plaster, and concrete. The flame retardants market in the building & construction industry is witnessing high growth in almost all the regions such as North America, Europe, and Asia-Pacific; especially in countries such as the U.K., the U.S., Germany, and Singapore. Increased regulations pertaining to fire safety in the developed economies such as Japan, the U.S., Germany, Australia, and Singapore is expected to drive the flame retardants market at a considerable rate. The application of flame retardants in wires & cables vary on the materials being used, the function of the product, and the level of fire resistance that must be achieved based on the fire safety standards. Each flame retardant has a unique characteristic that makes it necessary to be matched appropriately to the materials used. The wires & cables market is expected to witness a significant growth in demand in the near future. This growth is expected to be driven by rapid expansion in wind energy, nuclear energy, telecommunication, and other end-use industries. Most of the electronic products have flammable properties and are subjected to fire risks due to electrical short circuits which could ignite the product. Therefore, it is compulsory to meet the fire safety regulations while manufacturing these components. Flame retardants increase the thermal resistivity of electrical products, thereby, increasing the product life cycle. They provide the products with fire resistance characteristics which provide them insulation in the internal and external parts of the products. The types of flame retardants used in the electronics industry are bromine (predominantly TBBPA), chlorine, phosphorous, and nitrogen based. What are the upcoming type of flame retardant chemicals? The leading players in the flame retardants market include Albemarle (U.S.), ICL (Israel), Clariant (Switzerland), Lanxess (Germany), Nabaltec (Germany), The Dow Chemical Company (U.S.), BASF (Germany), Akzo Nobel (Netherlands), Italmatch (Italy), and Huber Engineered Materials (U.S.). The global companies are continuously expanding their operations by forming agreements with domestic distributors for stronger distribution network.